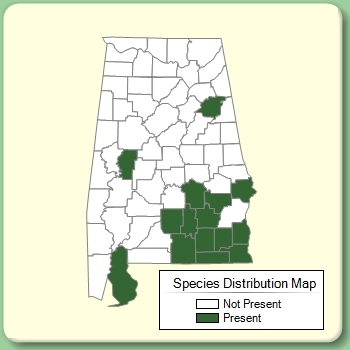 Habitat: Cultivated as a food crop. 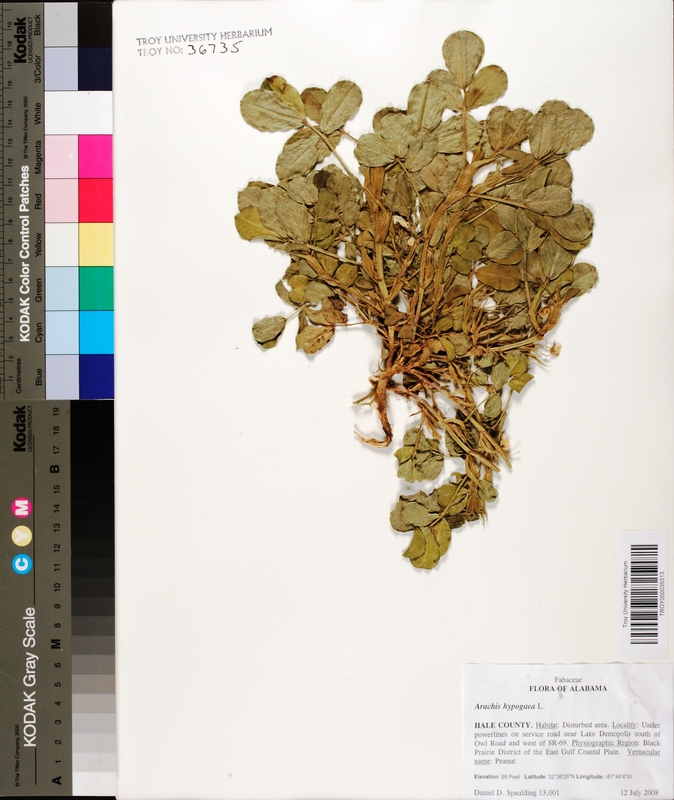 Citation ARACHIS HYPOGAEA Linnaeus, Sp. Pl. 741. 1753. Type: BRAZIL/PERU: Cult. in Netherlands, without data, Herb. 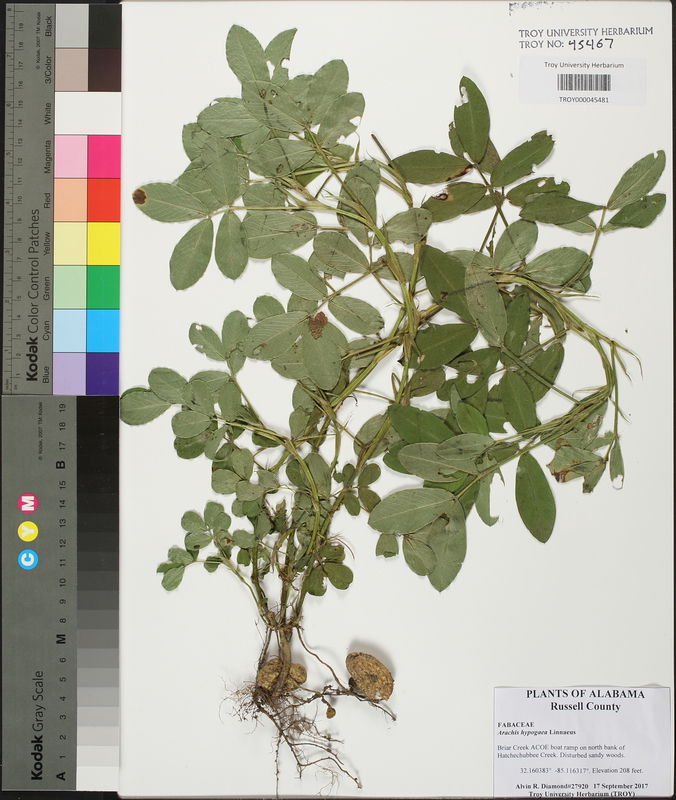 Clifford 353, Arachis 2 (lectotype: BM). Lectotypified by Krapovickas & W. C. Gregory, Bonplandia 8: 148. 1994. Arachidna hypogaea Arachidna hypogaea (Linnaeus) Moench, Methodus 122. 1794. Arachis hypogaea Linnaeus 1753. Arachis africana Arachis africana Loureiro, Fl. Cochinch. 2: 430. 1790, non Burman f. 1768. Arachis glabrata subsp. 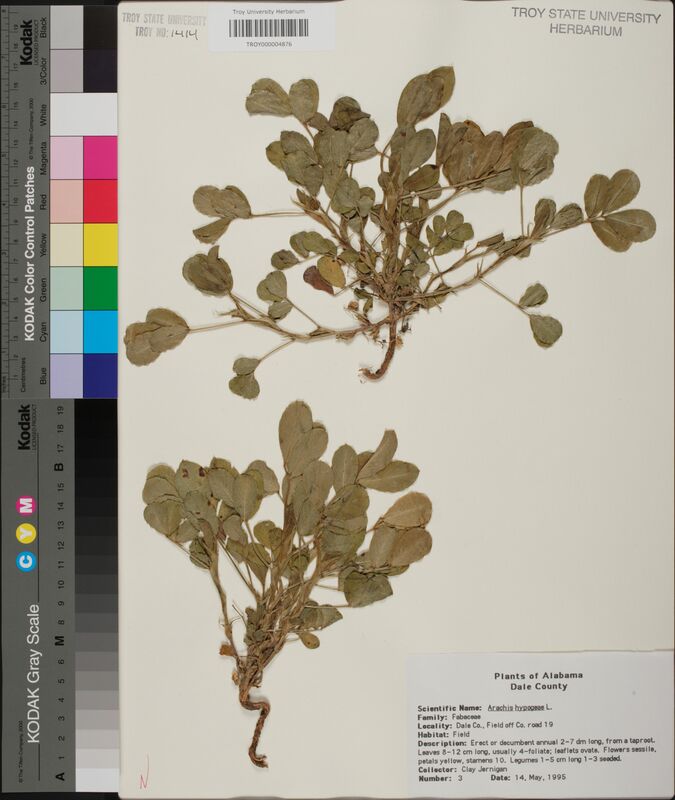 rasteiro Arachis glabrata Bentham, subsp. rasteiro (A. Chevalier) A. Chevalier, Rev. Int. Bot. Appl. Agric. Trop. 28: 515. 1948. Arachis rasteiro A. Chevalier 1929. Arachis hypogaea subsp. 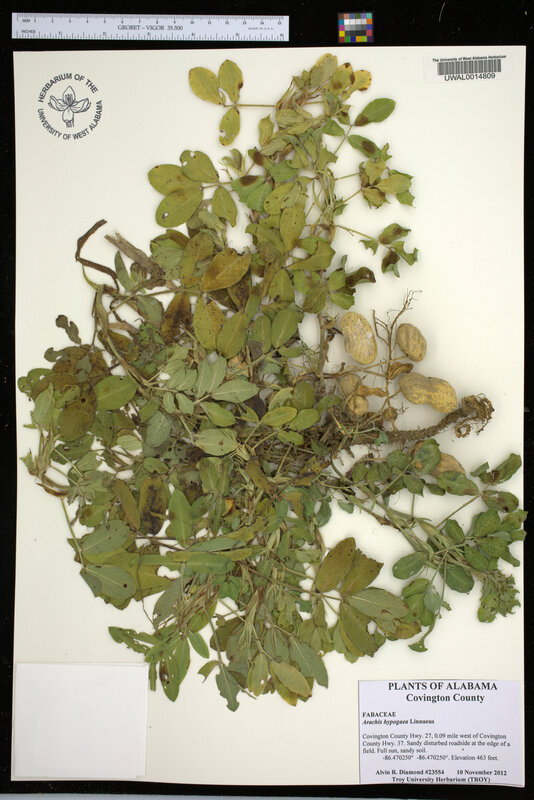 nambyquarae Arachis hypogaea Linnaeus, subsp. nambyquarae (Hoehne) A. Chevalier, Rev. Int. Bot. Appl. Agric. Trop. 13: 772. 1933. 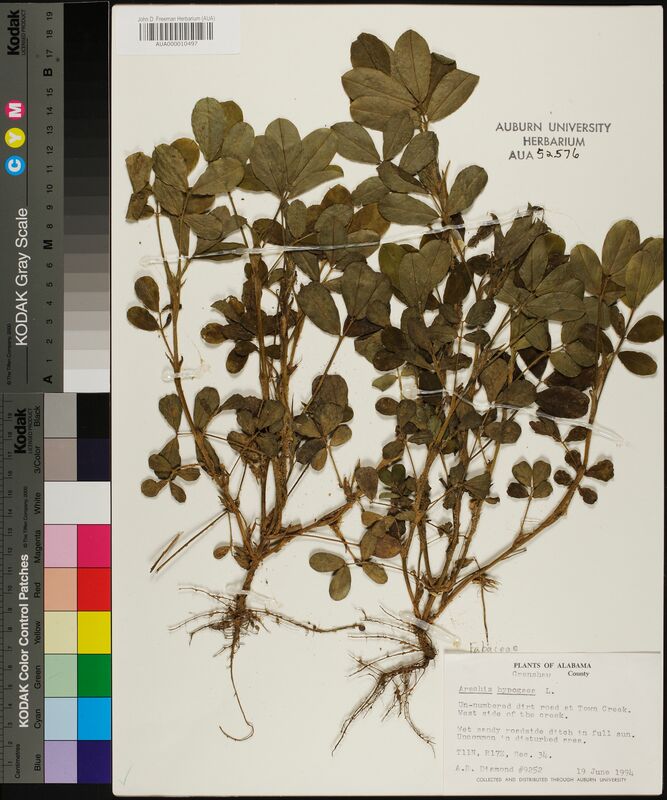 Arachis nambyquarae Hoehne 1922. Arachis hypogaea subsp. 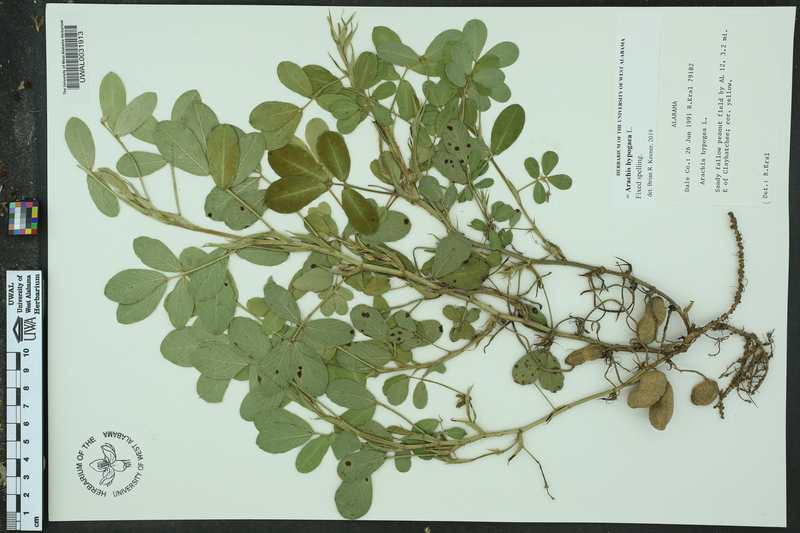 oleifera Arachis hypogaea Linnaeus, subsp. 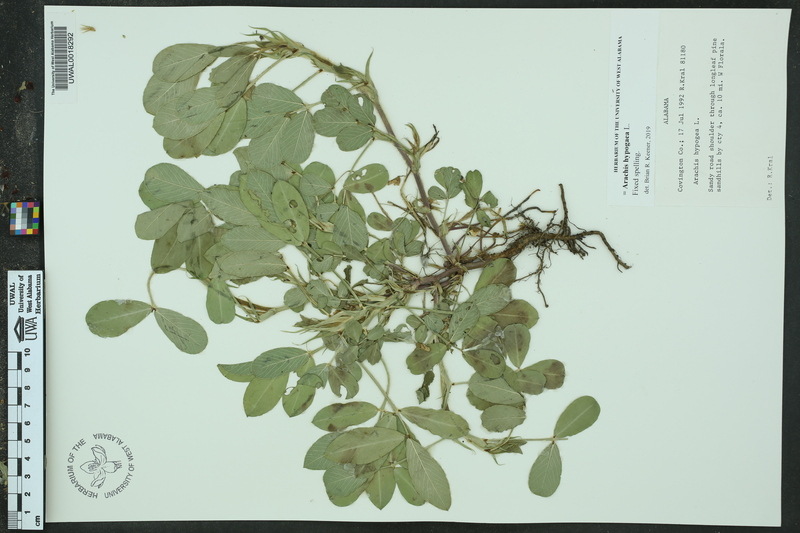 oleifera A. Chevalier, Rev. Int. Bot. Appl. Agric. Trop. 13: 770. 1933, nom. inadmiss. Arachis hypogaea Linnaeus 1753. Arachis hypogaea var. 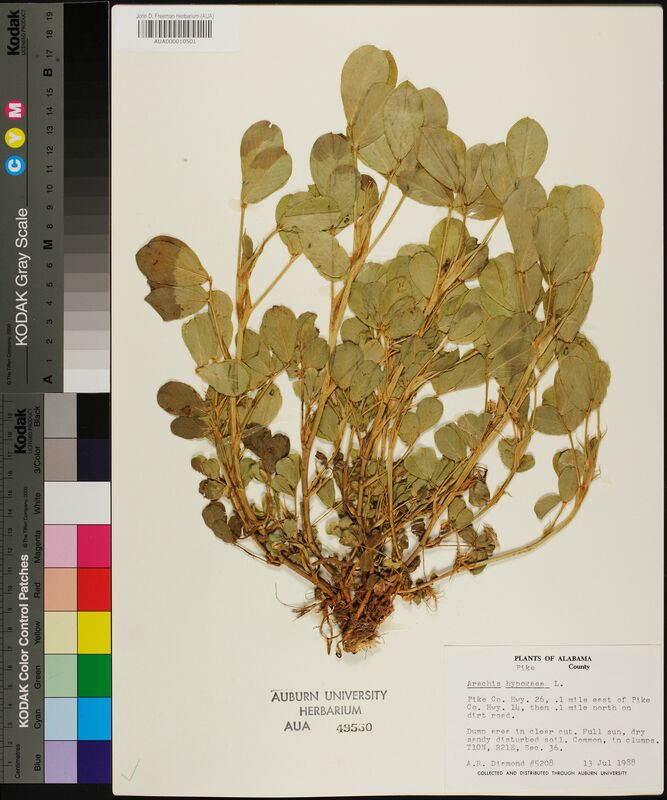 glabra Arachis hypogaea Linnaeus, var. glabra de Candolle, Prodr. 2: 474. 1825. 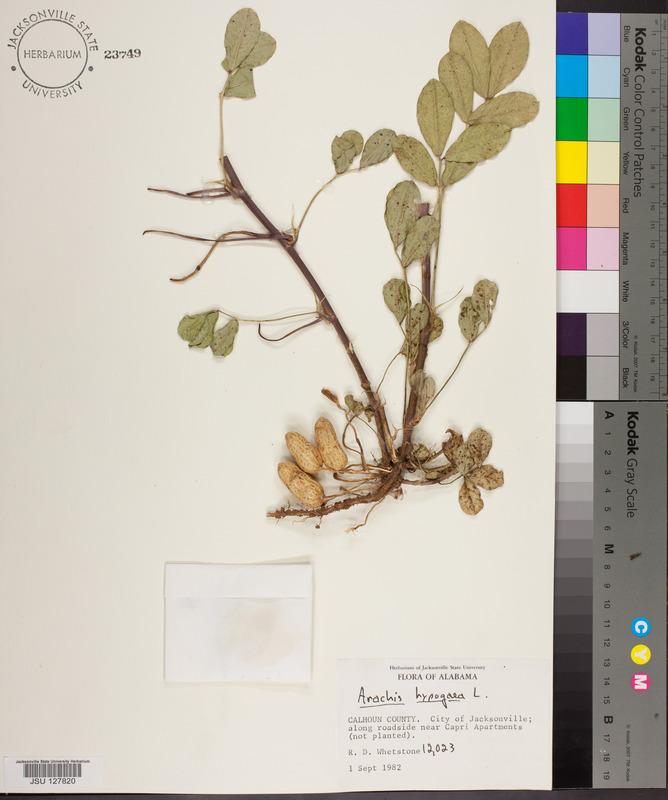 Arachis africana Loureiro 1790, non Burman f. 1768. Arachis hypogaea var. macrocarpa Arachis hypogaea Linnaeus, var. macrocarpa A. Chevalier, Rev. Int. Bot. Appl. Agric. Trop. 9: 194, pl. 5-6. 1929. Arachis hypogaea var. africana Arachis hypogaea Linnaeus, var. africana Girola, Cult. Mani Argentina 17. 1922, nom. illegit. et non K. Kurtz 1875. Arachis hypogaea Linnaeus, var. 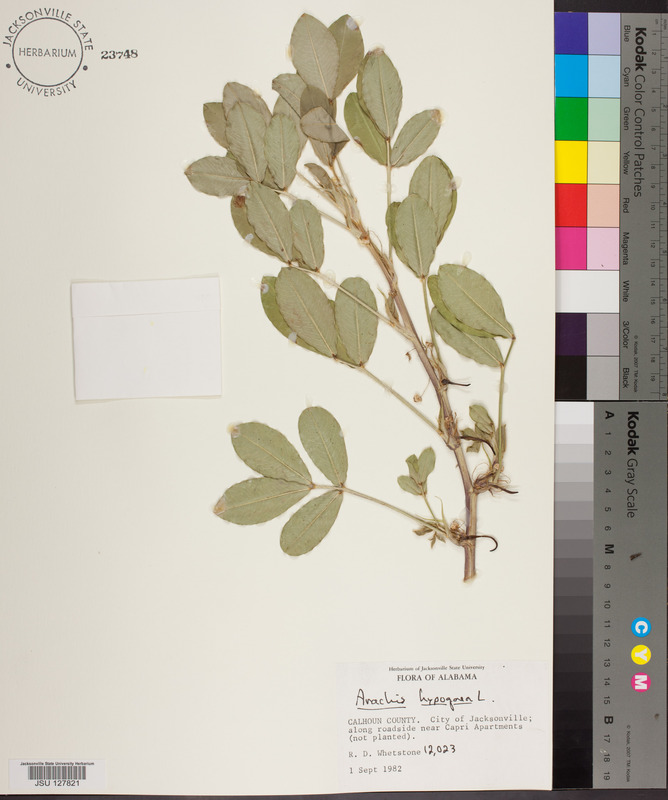 glabra de Candolle 1825; Arachis africana Loureiro 1790, non Burman f. 1768. Arachis hypogaea var. communis Arachis hypogaea Linnaeus, var. communis A. Chevalier, Rev. Int. Bot. Appl. Agric. Trop. 9: 193. 1929. Arachis hypogaea var. microcarpa Arachis hypogaea Linnaeus, var. 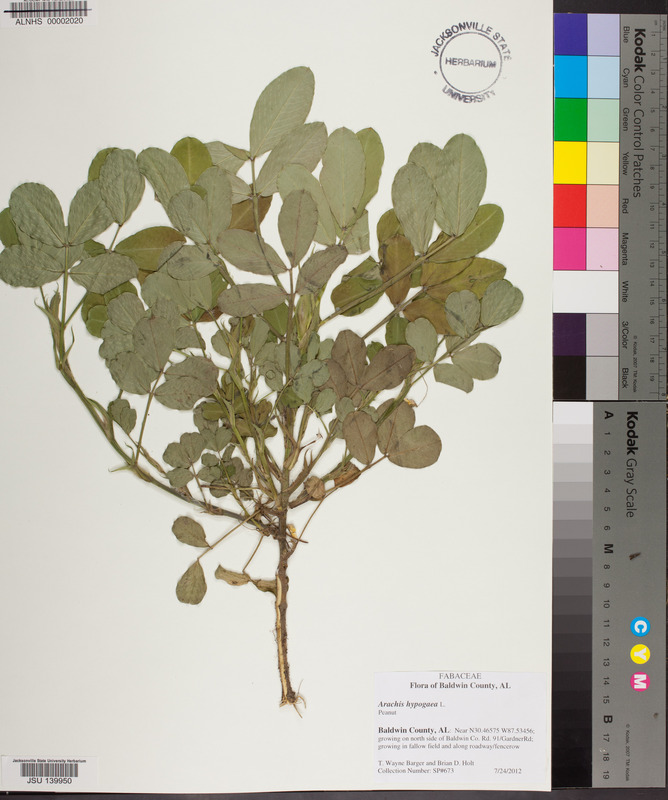 microcarpa A. Chevalier, Rev. Int. Bot. Appl. Agric. Trop. 9: 194, pl. 5-6. 1929. Arachis hypogaea subsp. procumbens Arachis hypogaea Linnaeus, subsp. procumbens Waldron, Contr. Bot. Lab. Morris Arbor. Univ. Pennsylvania 4: 312. 1919. Arachis hypogaea subsp. rasteiro Arachis hypogaea Linnaeus, subsp. rasteiro (A. Chevalier) A. Chevalier, Rev. Int. Bot. Appl. Agric. Trop. 13: 772. 1933. Arachis rasteiro A. Chevalier 1929. Arachis hypogaea var. 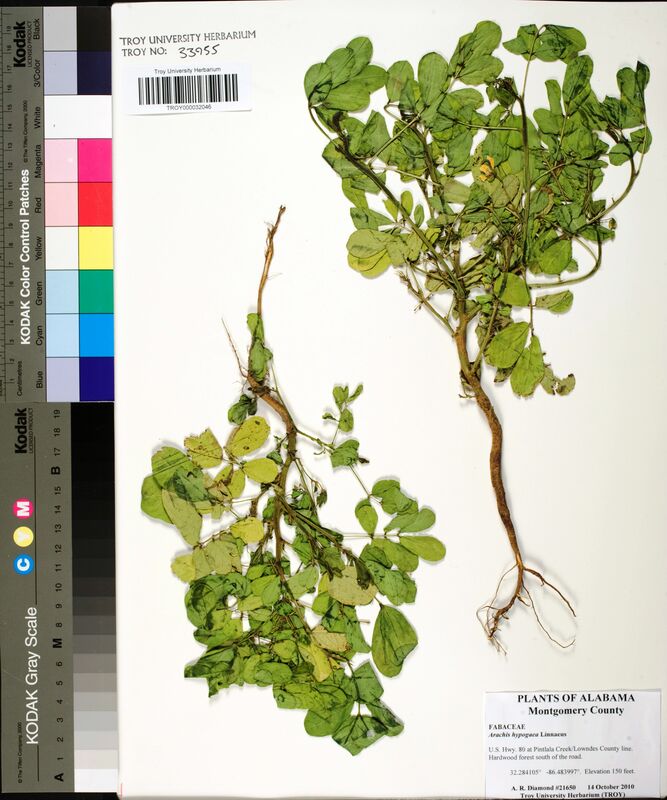 aegyptiaca Arachis hypogaea Linnaeus, var. aegyptiaca Hasskarl, Retzia 1: 190. 1855. Arachis hypogaea var. 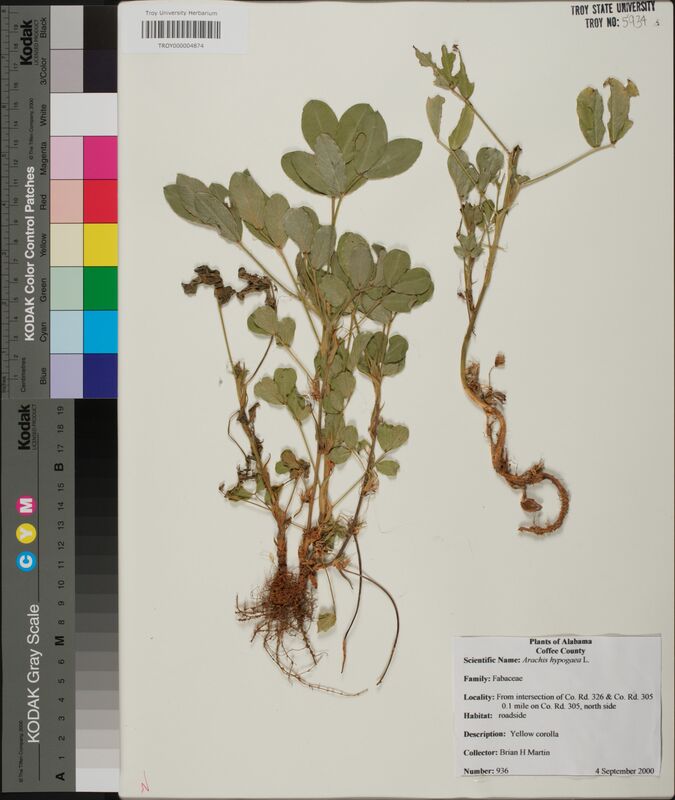 gigantea Arachis hypogaea Linnaeus, var. gigantea Patel & Narayana, Curr. Sci. 4: 737. 1936. Arachis hypogaea var. indica Arachis hypogaea Linnaeus, var. indica K. Kurtz, Ver. Bot. Vereins Prov. Brandenburg 1875: 45. 1875. Arachis hypogaea var. 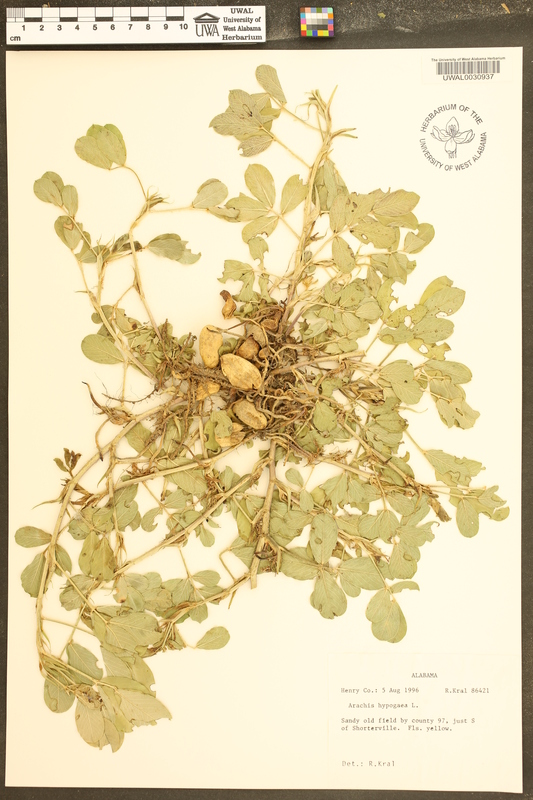 nambyquarae Arachis hypogaea Linnaeus, var. nambyquarae (Hoehne) Burkart, Darwiniana 3: 281. 1939. 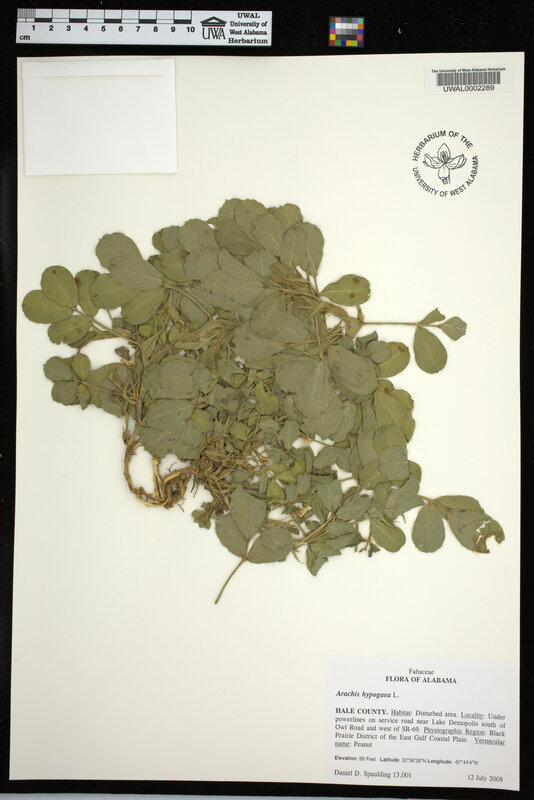 Arachis nambyquarae Hoehne 1922. Arachis hypogaea var. 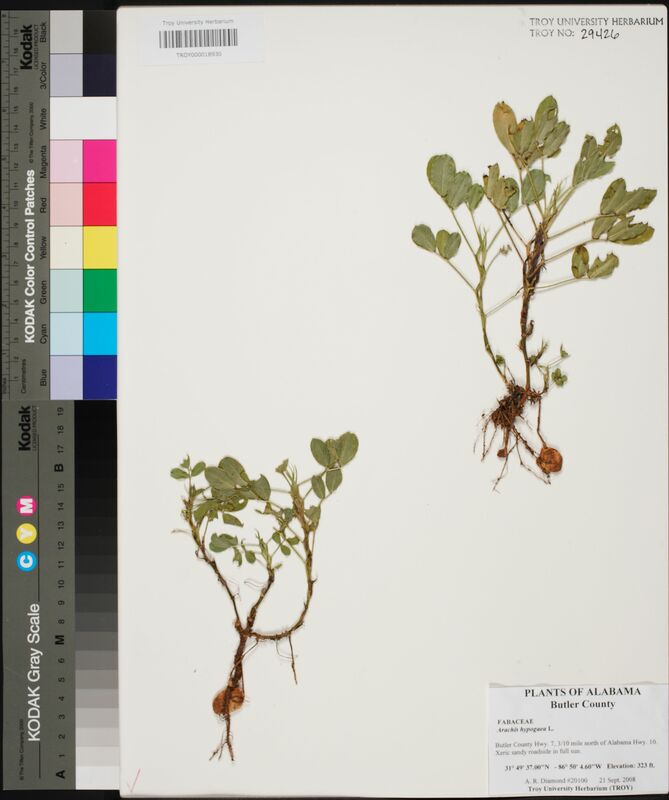 robustior Arachis hypogaea Linnaeus, var. robustior A. Chevalier, Rev. Int. Bot. Appl. Agric. Trop. 9: 193. 1929. Arachis nambyquarae Arachis nambyquarae Hoehne, Comiss. Linhas Telegr. Estrateg. Mato Grosso Amazonas 12: 21, pl. 190. 1922. BRAZIL: Rondonia: Cult. 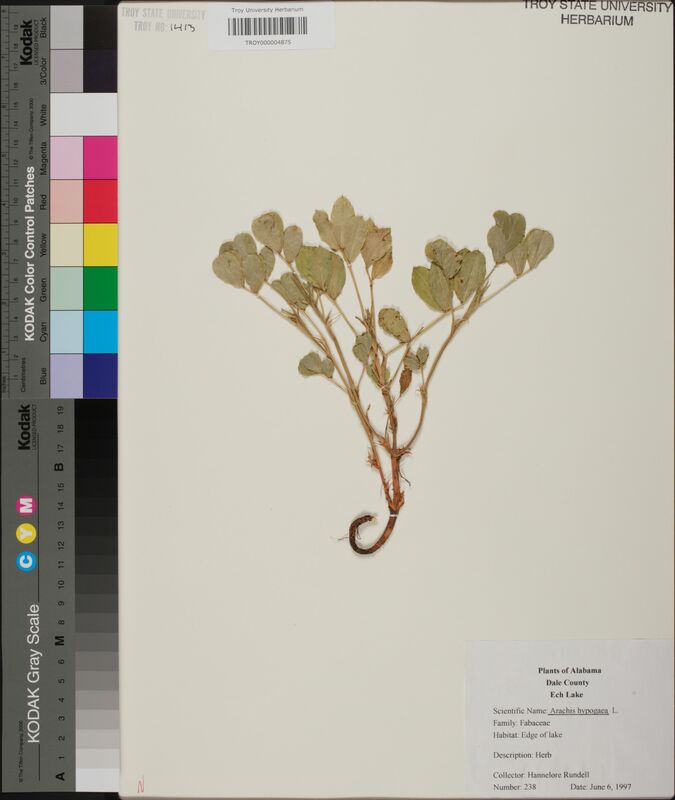 at Pimenta Bueno, Apr 1919, Kuhlmann 2052 (holotype: R). Arachis rasteiro Arachis rasteiro A. Chevalier, Rev. Int. Bot. Appl. Agric. Trop. 9: 196, pl. 5-6. UWAL0018292 Covington 17 Jul 1992 Kral, R.
AUA000010501 Pike 13 JUL 1988 DIAMOND, JR., ALVIN R.
AUA000010500 Pike 24 JUL 1969 SIMMONDS, E. P.
UWAL0014809 Covington 10 Nov 2012 Diamond, Alvin R.
AUA000031180 Covington 24 Jun 2010 HANSEN, CURTIS J.
UWAL0002289 Hale 12 Jul 2008 Spaulding, Daniel D.
UWAL0030937 Henry 05 Aug 1996 Kral, R.
AUA000010499 Montgomery 11 AUG 1969 OWENS, JAMES R.
UWAL0031913 Dale 26 Jun 1991 Kral, R.
AUA000010497 Crenshaw 19 JUN 1994 DIAMOND, JR., ALVIN R.
AUA000010498 Lee 31 JUL 1969 MCVAY, D. A.